EcoVac® is used exactly like a regular toilet – but uses extremely low volumes of water and energy. When you flush the waste transports all the way to the tank / container in a second. Because of using smaller pipes (50mm) and that the pipes are always empty the extremely efficient vacuum makes the low flush volumes possible. The waste transports by air instead of water. Thet is just a little water inside the WC to keep the hygiene level high. The flush volumes are 0,6 Liter, which is more than 90% less than most toilets on the market. (4-12 Liter). Thanks to the patented vacuum system, the vacuum is only used for a couple of seconds each time and is therefore extremely energy efficient as well with approximately 5 kWh energy used per year. About 1 dollar a year in electricity bill. Power: 230V or 3000W inverter with battery. Yes. One of the advantages with a vacuum toilet is that the piping can go upwards. We recommend a max of approx. 2 meter rise of the pipes above the toilet. It’s recommended to keep a steady inclination of a maximum distance of 30 meter to the tank or drop off station. Flush volume in Liters. EcoVac compared to regular WCs. Emptying of septic tank approximately once per year approx (full time regular family household) The cost for emptying is varying a lot. We use an example of 200 USD per time. The EcoVac turbine is a “wear and tear” part which can be outworn after 5-7 years. A new is easily replaced by yourself for the cost of 200 USD (2019 price list). The average yearly cost for using an EcoVac is about 250 USD per year including everything (including future spare parts). For comparison to other popular toilet models see the chart below! Costs per year for popular toilet models. Measured in US dollars. Average of 5 years into the owning of different toilet models. You can install EcoVac where normal water toils is not allowed thanks to the extremely low flush volumes of about 0,6 liter. It can actually save up to 95% water. The pipes are always empty which means you can put the pipes shallow in the ground. Or even outside on the ground. You can mount the 50mm pipes upwards, sideways, trough walls and through floors in many flexible ways. Feels like a standard toilet! EcoVac looks and feels exactly like a standard water toilet, which makes it feel just like home. Ceramic is the only sustainable material. EcoVac is made of porcelain which is the only sustainable material over time for hygienic reasons. Plastic, metals and other solutions feels worn out and is harder to keep fresh over the years. Use EcoVac instantly over and over. An incineration toilet normally needs some time before the next person can use the toilet. EcoVac can be used instantly after one another, and can be used hundreds of times per day in busy cafés, boats, and so on. Use it around the clock, with no extra costs. In a typical summer house or cottage you will use EcoVac for every toilet visit, regardless if you’re just doing nr 1 or nr 2. It just doesn’t really matter how many times you use it. It takes up to 3000 toilet visits before you need to empty a standard sized septic tank (approx. once a year). You don’t need to use any refills or other gadgets. EcoVac is much more economical. EcoVac is so much more eco-friendly. Incineration toilets can be easy to install and use in some cases, but they are not an eco-friendly alternative. Some toilets that are called “vacuum toilets” uses a grinding machine that mixes the waste to small particles and the pushes the waste to the tank. In the case of a power failure (common on islands), you can use your EcoVac toilet anyway by using a bucket to flush the toilet (if the piping has self-fall). Other kinds of grinding toilets always has the pipes full of waste, and a grinder to pass trough. Since the 50mm vacuum pipes is always empty it’s not necessary put the pipes deep in the ground, they can actually be outside. Since there is no cutting blades or machine that the waste will go trough, the EcoVac is very reliable and will most often handle things well that usually shouldn’t be flushed down a toilet. EcoVac is a logical and natural soft-vacuum system that doesn’t need any expensive spare parts. The only thing that might needs to be replaced is the turbine inside the BASE-cover. After 5-7 years it might need replacement and that will cost approximately 250 EUR. EcoVac BASE with a 3000 Liter tank. The vacuum unit is mounted on top of the tank or beside the tank in a cellar or outhouse. Can be enough for about 3000 toilet visits (emptying about once a year for a 4-5 people sized family). 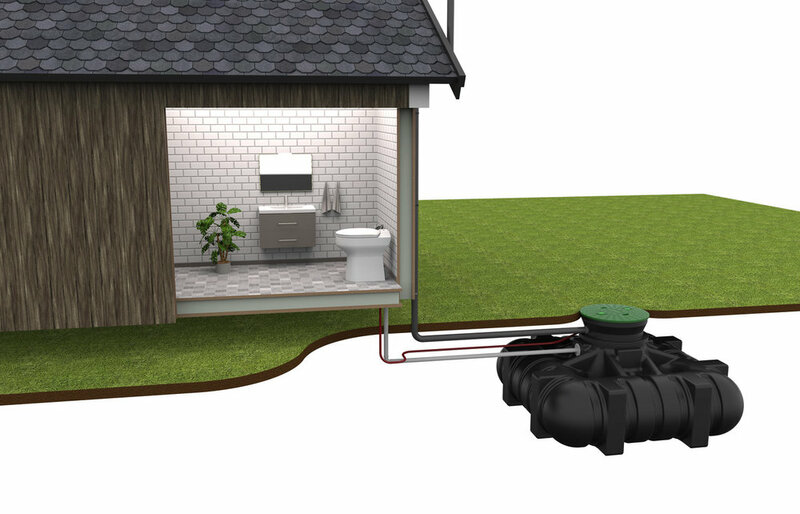 Example of EcoVac EXTEND with a 1250 or a 2250 Liter tank above ground, for example behind the house (takes up about 1,5 m2). The vacuum unit is on top of the tank or in the same room as the tank. This size lasts about 1000-2000 toilet visits! Can the piping go upwards? How much water do I save with EcoVac? How much money does EcoVac cost to maintain? What are the advantages to other kinds of toilets? How often do I need to empty a septic tank?